Star Wars Darth Vader 18 oz. Ceramic Oval Mug: "You don't know the power of the dark side!" Or do you? If you take your coffee black, then you totally know the power of the dark side, and this Star Wars Darth Vader 18 oz. Ceramic Oval Mug will help you spread the word! 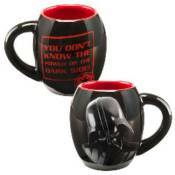 Coloured black on the outside and red on the inside, this Force-ful mug features an image of Darth Vader's helmet on the front, with the words "You Don't Know the Power of the Dark Side" in red on the back. Able to hold 18 ounces, it's a must for Star Wars fanatics!